Developed by Konami for the Game Boy in 1991, Operation C brought the fast=paced, guns blazing action of Contra to the tiny green and white screen. Earth is under attack by aliens, again, and it's the job of two shirtless supermen to infitrate their ranks and kill every last on of them. 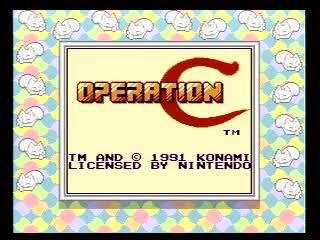 Borrowing elements from both Contra and Super C, Operation C does well to stand on its own in the series rather than being just a straight port. Best time: 0:11:44 by Kyle 'Mr. K' Halversen on 2012-03-24. This is a speedrun of Operation C for the GameBoy. It combines elements from Contra and Super C. It's a pretty solid portable and it adds some unique elements so it's not just an imitation. This game is definitely a lot easier than the other Contra games. It's both easier to run and to optimize. Adelikat- Your TAS of this game was not only wildly entertraining, but it inspired this run. I pretty much stole your route with only a few adaptations. I wish I could be amazing like you and run through walls, but I did get a little bit of showboating in there. Thank you for your help. I just messaged you out of the blue with some questions and you gave me some helpful advice despite the fact that it's been almost 5 years since you submitted your TAS. Mike- Where would Contra speedrunning be without you? Spread - The first time you pick up Spread it only shoots 3 shots. If you pick up another Spread it shoots 5. Unlike previous Contra games, if you stay up close to an enemy only one of the bullets does damage. This makes spread worthless. I only use it to take out some enemies behind me in the first stage and put it out to pasture immediately. Homeless (Homing) - Operation C marks the introduction of the Homeless (Homing) shot. This gun makes a spectacular debut. It fires at the same rate as the spread gun. The only difference is that it homes in on enemies quickly and with deadly accuracy. Imagine the spread gun from the first game shooting guided missiles instead of red bullets. That's H in this game. Why would you want your bullets to spread out in multiple directions when they can all just go directly to their target? The only reason why I switch weapons in the run is because like spread, not all of the shots register damage if you are in point blank range from an enemy. Had it not been for this fact, we would all tremble before the might of the homeless shot! Its successors in future games would always be a shell of its former glory. Fire- FIRE!!! The fire weapon in this game works the same way it does in Super C. It shoots a ball of fire that explodes in four different directions when it hits something. It does the best damage of all of the weapons when you are point blank and this is the only reason why I don't stay homeless throughout the run. I try and conserve bullets during the first part of the stage. The hovering robot cleans the barrel of my rifle with his cleaning pole. The submarine fight is the slowest in video game history. It takes longer than Mega Man X and Contra 4 combined. Stage 1 is pretty straightforward and it's hard to screw up. Nothing escapes the homeless shot. I can't do the crazy diagonal manipulation in the tool assisted run, but I do take out the first tank pretty fast. I switch to fire a bit earlier than the TAS does because I need fire. I do the pyromaniac polka on the third tank. It works pretty well. Not too much to say here. The jumping could be just a little bit faster in places, but it doesn't cost much time. I can't do the quick kill on the stage 3 boss like the tool assisted run does. This stage is pretty easy. I just have to wait for one of the reaching claws. The tool assisted run walks through an object to skip past it. I don't have that luxury. I use my new stage 4 boss strategy here. It saves about 10 seconds. More importantly, it looks cool. I turn back and shoot the soldiers to reduce lag. I really wish I could do the tricks from the tool assisted run, but it's enough that I don't lose any time. Thanks to some manipulation with the positioning, I'm able to get past the bubbles without stopping. This also lets me get into point blank range for the final boss fight. Normally you'd be on the far left hand side of the screen. The final boss doesn't last too long as a result. With correct positioning you can run through all of the lasers on the final corridor without stopping. You have to wait for the last pair of lasers. That is of course unless you are cool and offscreen. I set fire to a helpless specimen trapped in a tube to finish the game. I strike an aggressive pose to finish up the game. You might want to make sure you keep watching the video after the credits stop. There is a special surprise at the end. As far as improvements to this run go, you might be able to squeeze a bit of time from improved jumping in stage 3 and you might be able to save a second or so on the stage 4 boss fight. If someone finds a way to duplicate the TAS strategy on the stage 3 boss that could also save some time. You can also look for some opportunities to reduce lag. All in all, this run is pretty decent and I'm satisfied for now.